Let the noise of the waves cradle you among splendid panoramas. The nature will be the true protagonist, and you will discover its strength and you will become her lover. SURFtoLIVE has created for you the ideal sceneries to make your permanence in Biarritz and Anglet(French Basque Country) something more of a tourist stay; giving you the possibility to use our structures and our services, you will become an all one with the culture of the surfers and the inhabitants of this splendid and radical world. If you consider yourself a true surfer and you have already come to visit us, you will surely have the desire to come back, otherwise hurry up to do it, it will be an unforgettable experience. An elegant town, surrounded by vegetation and culture, with lot of beaches touched daily by the Ocean. 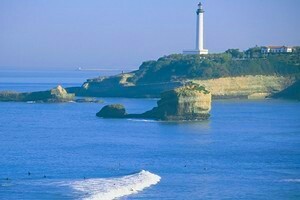 Our accomodations are located in the best place of the French Basque Country, near the best spot for surfing. Discover with us the strength that has purified a lot of people leading'em to the true surf. Recommended by us: BOOK BEFORE JUNE. You will receive particular DICOUNTS.